I say thank you as well. This post brought tears to my eyes, as, yet again I was getting wrapped up in news! Oh, it brings me so low and distracts me from my God given duties. 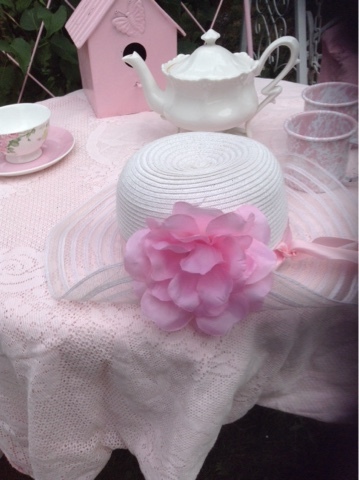 I will set up a tea for the children and I today. God bless. This meant so much to reas this morning. A blessing. I love your table setting. I wish I could be there enjoying some tea with you. I am being diligent to not take in negative things from what is going on in society. 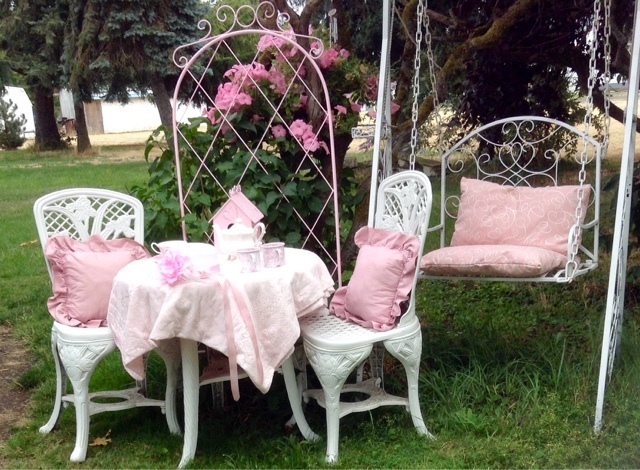 I create a little haven here in my home and I would never know there is a thing wrong out there as long as I keep my focus on Jesus and my home mission. Kelly T.
I, too, take care not to let the obsessions of the outside world into my home. I used to be consumed with the news, devouring it daily and forming arguments and defenses in my mind all day long. My home was an afterthought instead of being the focus, and my heart did indeed race as you mention. I gradually came to realize that I could form all of the opinions I wanted and solve as many of the world's problems as I wished, but no one was coming to me asking for them. So what was the point? All I got out of those times was a weakened immune system that I'm still dealing with, and a housekeeping debt I'm still paying off. Nowadays, when people ask if I've heard about this earthquake our that political scandal, I turn a blank look to them, calmly say no, and ask what good book they've read lately, or handicraft they've rediscovered. I went three days after the presidential election before I was told who won (my husband was the informant). None of it affects my daily life, so why let it consume it? My favorite true story about this was from a now-defunct forum. This topic was much the same, on focusing on your home and garden and letting the outside world fade into the very background. A woman relayed that she had been a nurse in the '90's, and in the reserves (this was in England). The Gulf War ended just before she was to be shipped out, and she called her parents with much relief to tell them she wasn't off to war. Her mother distractedly said, "War, dear? What war?" Her daughter was flabbergasted that her mother didn't know about this major upset in the world, and asked how her mother was so uninformed? "It's been a bumper year for the garden, dear, and we've been ever so busy with that." I like Ladypinktulip's wording...my home mission. I am going to have a home mission here too. We get so much rain that I can't leave a tea setting out such as yours, Lydia. How I would love to...outside. But maybe I can inside. 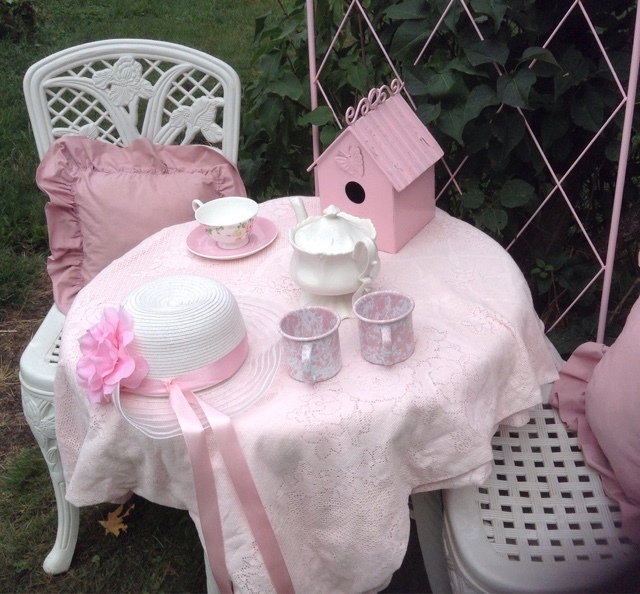 Lydia...I meant to add your outside tea setup is just as charming as can be!!! Great great story from your old forum, by the way. Great story. Very effective. Don't apologize about the long comment. It is good! Yea no one will stand still long enough to hear our well planned arguments for or con a political or religious cause. And after all the time we put into the news, it won't get the housework done. It's eerie how addictive all the problems of the media (for how would we know unless broadcast to us by them?) or the crazy way a neighbor or relative acts. Even religious arguments can spin around in the mind. They say adrenalin is the drug of choice for women, as they get surges of it to cope with all that worry. I used to worry about everything from war to the end of the world to all the u saved people. My husband Was very young at the time; still in his twenties, and his reaction was to tell me all I had to do was be pretty for him and make delicious things to eat. I laughed at the time because it did not sound deeply intellectual (something you g women seem to value perhaps more than love and simple good works)It was such a relief to be reminded I was not to worry about the rest of the world. When women get too worried about all the outside things it affects how they handle home living. A day worrying cannot be recovered, and children are greatly affected by it. We are creating memories and so let's be careful how we live and how we think. Oh Shani! I love your comment. Thank you, actually! My pleasure, Mrs. O! I'm not usually a big commenter, but this vacation has exposed me to the world at large and I'm longing for my safe little world. This blog is helping me to stay balanced whilst we're travelling, and all of the lovely comments are encouraging. So thank you, as well! Thanks Shani, I have enjoyed reading your comments - I have been guilty of letting world events/news overwhelm me in the past & it is very comforting to know I am not the only one who is trying to remove these influences from my daily life at home. Yes, Lady Lydia, I often catch myself with tense shoulders, letting anxiety take hold, and I find a nice cup of tea and some time spent in nature works wonders! 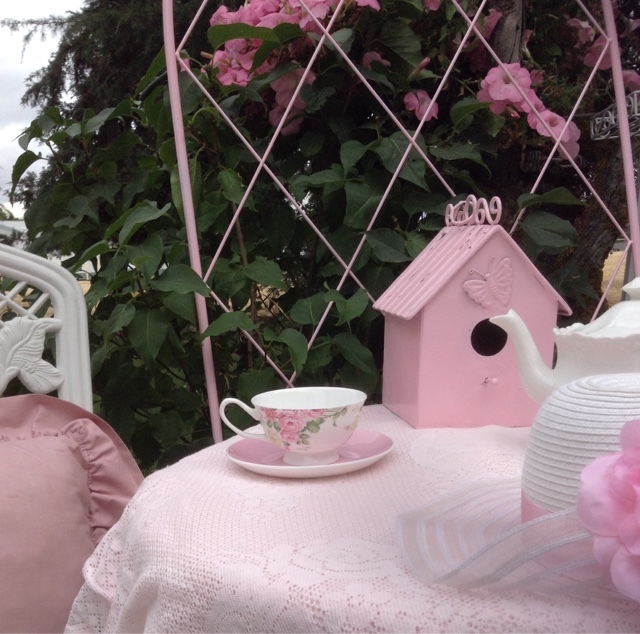 Your tea table is so sweet and inviting. Are those pink and white cups enamel ware? They are so cute. 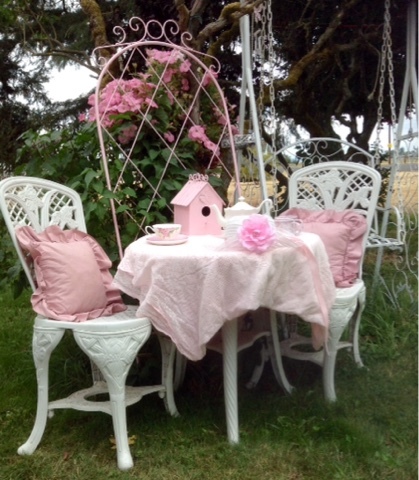 May I ask, what is the plant behind your tea table with the pretty pink flowers? That is just beautiful. 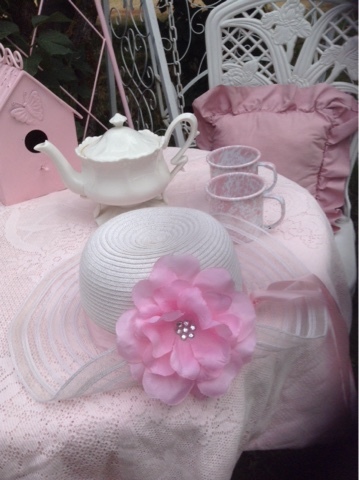 Goes so well with your pink tea table and cups. It is a handing pot with petunias ans other types of flowers in it.